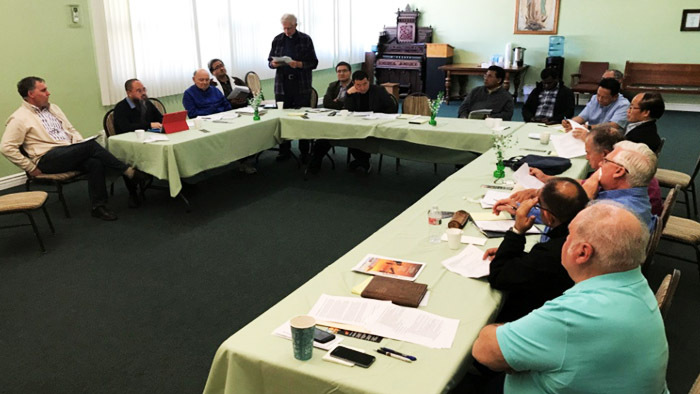 On March 14th the local superiors, dimension coordinators and the provincial council members gathered at Riverside residence to discuss on the 2018 General Chapter document. Everyone except three was present for the meeting. Soney presented a power point on the Chapter document to help the members with the discussion and planning. Later the participants were divided into four groups to discuss on the various topics and points given in the Chapter document. Each group presented a report of the discussion. Significant Aspects of General Chapter 2018: Interculturality is the DNA of our Society, and key words of the documents include renewal and transformation. Our challenge is to experience the love of Christ with all its implications, the need for conversion and our responsibility as we continue our mission. Our name is our mission. The objective of the 18th General Chapter is a spiritual rekindling and commitment. We achieve this objective by personal and communal reading, an explicit commitment to an action plan and a collective province decision. From the previous chapters we have attempted to identify our mission in the present world. In 2006 it was Prophetic Dialogue as a lens to focus some aspect of our life as Divine Word Missionaries. In 2012 it was an action plan with Congregational Directions. In 2018, Pope Francis called us to return to our roots and origins as envisioned by our founder. Each district and the community will conduct a similar discussion on the Chapter document and the result will be pooled together to arrive at a province program to implement the Chapter document and the resolutions.